" Making York Region The Best Place to Raise all Families"
A grassroots community group which began as a coupling of the "Pay the Rent & Feed the Kids Program" and the "Ontario Disabilities Support Program Action Coalition" (Y R Chapter). 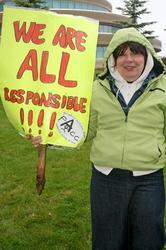 Many PACC members and supporters have "lived experience" with income support issues. PACCers are based in York Region Ontario, Canada, where members work cooperatively within the community and sectors, to educate, find solutions, and seek to minimize (the effects of) poverty amongst our most vulnerable. PACC's mandate is, "To raise community awareness of poverty and the income security issues facing marginalized York Region residents through research, public education, and initiatives that effect change". PACC has become the voice of those on low income supports in York Region and welcomes anyone with a passion to make a difference. Paccers get involved through numerous related and self imposed initiatives driven by the issues brought forth directly - from those living on the margins. Most recently , in 2010 - PACC acted as host group for ISARC's YR social audit which PACC successfully lobbied to get for the 1st time in YR history. In early 2011 YR Council endorsed in principle the themes and recommendations of the resulting YR report - ' Behind The Masks - testimonials from those marginalized by income". PACC has generated and provided source information for numerous media stories from national to local coverage providing local residents and shelters / support groups unmatched free publicity. Some news articles have won awards via key PACC supporters' input. PACC has created its own media and " Channel" on youtube - povertyacc - with breathtakingly informative and informative self produced docu-style video media with 'hits" now reaching into the thousands in a few short months. Join us today. We don't talk a good game - we are one! 1.1 The Poverty Action for Change Coalition (PACC) is a group of community members/individuals, faith groups and community agencies that came about as a result of low social assistance rates (Ontario Works, Ontario Disability Support Program). 2.1 To raise community awareness of poverty and the income security issues facing York Region residents through research, public education and initiatives that effect change. 3.1 Raise social assistance rates to the actual costs of rent and living. 3.2 Index social assistance benefits to the cost of living. 3.3 Provide adequate level of funding for childcare allowances. 3.4 Provide transparency to recipients around all benefits available under each program. 3.5 Educate various groups/organizations and community around issues facing people living in poverty. 3.6 Identify and work toward eliminating barriers in each social assistance program. 3.7 Raise wages to levels above the Low-Income Cut-Off (LICO). 5.1 Anyone may join PACC by supporting the mandate of PACC. Participation levels may vary without discrimination. 5.2 PACC members will identify what they are interested in being involved with (i.e., meeting, actions, etc.). 6.1 The coalition is accountable to its members. All working groups and sub-committees are accountable to the membership of PACC. All individuals who sign Endorsements are considered members. 6.2 All members of PACC must respect and protect fellow members’ rights to privacy and confidentiality. A members’ information will not be disclosed or shared without explicit permission from the member. Please see attachment What is Confidentiality? 7.1.1 The Co-ordinating Committee includes the Chairperson of each Chapter or their designates, two representatives from each Chapter, and up to three representatives who are in receipt of Ontario Works and/or Ontario Disability Support Program. 7.1.1a Chapter Chairs and Representatives on the Co-ordinating Committee represent their Chapter membership, not their individual selves. 7.1.1b Preference for Co-ordinating Committee representatives/membership will be given to individuals whose income is lees then the current Low Income Cut-Off (LICO). This can be determined through self-disclosure. 7.1.2 The Co-ordinating Committee is responsible for co-ordinating chapters and being a conduit for information. 7.1.3b approval of Chapter activities, i.e. research, public education and initiatives. 7.1.4 Where possible, consensus will be obtained by the PACC membership (Please see Decision Making, 8). 7.2.1 The Finance Committee will consist of six members. 7.2.2 Three (3) members will have signing authority for PACC'S bank account. Two signatures are required for signing at all times. 7.2.3 The Finance Committee will update Co-ordinating Committee, through a financial report for the month. This report will be given to the Co-ordinating Committee at its monthly meeting and will be distributed to members via chapter meetings and emails. 7.3.1 Chapter Groups are encouraged to form and develop based on geographic location, social identity, etc. 7.3.2 Chapter Groups will meet monthly. 7.3.3 Ideas and suggestions for research, public education and initiatives from the Chapter Groups will be brought to the Co-ordinating Committee each month. 7.3.3a Materials, including but not limited to, letters, flyers, etc., related to approved Chapter activities will be completed and approved by the Chapters without the need for approval by Co-ordinating Committee/PACC membership. 7.4.1 Sub-committees may be created to work on specific issues from time to time. 7.4.2 These sub-committees will report to the Co-ordinating Committee. 7.5.1 There will be a Chairperson for each Chapter who will be chosen by the Chapter. 7.5.2 The Chairperson will hold a two-year term in office that can be renewed. 7.5.3 The Chairperson is responsible for ensuring the effective functioning of the Chapter through preparing agendas and attachments, circulating minutes and information, maintaining order at meetings, ensuring everyone has the opportunity to speak at meetings, summarizing decisions fairly, ensuring follow-through and serving as a spokesperson for the Chapter. The Chair’s conduct must be underpinned by PACC’s mission, purpose and values. Please see attachment What is the Role of the Chair (for PACC Co-ordinating Committee and Chapter)? 7.6.1 There will be a Chairperson for PACC Co-ordinating Committee who will be chosen by the Committee. 7.6.2 The chairperson will hold a two-year term in office that can be renewed. 7.6.3 The Chairperson is responsible for ensuring the effective functioning of the Co-ordinating Committee through preparing agendas and attachments, circulating minutes and information, maintaining order at meetings, ensuring everyone has the opportunity to speak at meetings, summarizing decisions fairly, ensuring follow-through and serving as a spokesperson for the Chapter. The Chair’s conduct must be underpinned by PACC’s mission, purpose and values. Please see attachment What is the Role of the Chair (for PACC Co-ordinating Committee and Chapter)? 7.7.1 This will be a member designated at each meeting to take the minutes for that meeting and will forward completed minutes to the Chairperson for distribution. 7.9.1 PACC is a grassroots, community-based and led organization. 8.1 Any major policy recommendations or actions should go through the membership and decision to act is made by the Co-ordinating Committee through consensus. 8.2.2 Co-ordinating Committee reviews recommendation and makes final decision on outcome. 8.2.3 Co-ordinating Committee brings decision and reason for decision to membership via email, prior to acting on decision. 8.2.4 Any person, agency or group that does not support the recommendation will have the opportunity to abstain or have their lack of agreement recorded. 8.3 All decisions will be minuted. 9.1 All Chapters will meet monthly. 9.2 Co-ordinating Committee will meet monthly. 9.3 All Sub-committees will meet when necessary or as outlined above. 3. Follow-up regarding requests for Chapter and Committee activities from last meeting. NEW!! YOUR KIDS CAN ACCESS FREE MONEY FOR SCHOOL OR TRAINING SIMPLY BY OPENING AN RESP ACCOUNT! PACC's original supporting collaborators in the community: Community Legal Clinic York Region, Canadian Mental Health Association-York Region, York Support Services, Future Abilities and Creative Employment, Krasman Centre, York Region District School Board, York Region Housing Corp, York Region Food Network. PACC is not affiliated with any political party.Members names are kept confidential and only used/released with full permission of the subject members. To raise community awareness of poverty and the income security issues facing marginalized York Region residents through research, public education and initiatives that effect change.